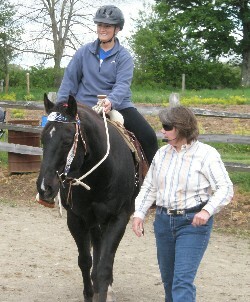 Want to gain new confidence on the trail for you and your horse? Then this Trail Horsemanship Clinic is for you! You'll see and practice some simple, yet extremely effective techniques to make your horse safer than you could imagine. 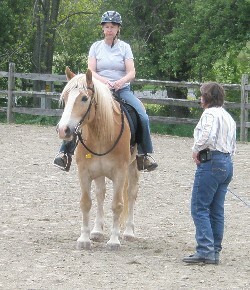 A clinic participant teaches her horse to relax when confronting scary things. 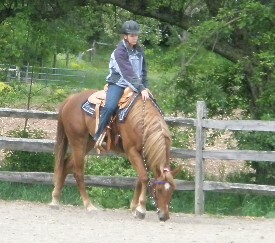 Photo from 2010 Trail Horsemanship Clinic at Three Springs Ministries. May 21 and 22, 2011 from 9AM to 4PM - 10 horses max. Spectator - $30 for the weekend. Save with a group! Pre-register 5 or more people by May 7 and save 10%! Please contact Kathy Huggins to pre-register. Saturday 9:00 – 12:00 Explanation and demonstration, answer questions from horse handlers and audience. Saturday 1:00 – 4:00 Owners achieve results with their horses on the ground. Sunday 9:00 – 12:00 Practice exercises from saddle, answer questions from riders and audience. Sunday 1:00 – 4:00 Owners ride and practice to achieve consistency from the saddle and in various more challenging situations. There will be space for only 10 horses to attend, so please register early! Want to participate but don't have a horse? There will be a few horses from Three Springs available to borrow for the May 21 & 22 clinic. Don't worry, you'll get to teach them because they don't know the useful things we'll show you. No rider will be pushed beyond their comfort zone, yet each person and horse team will learn, in the arena, new skills leading to safer and more enjoyable trail rides. There will be plenty of time for spectators and riders to ask questions. Riders will be asked to wear riding boots while mounted and hardhats are highly recommended. We want you to be safe! Lunch and restrooms will be available on site as well as John Lyons and Kathy Huggins horse training books, videos, bridles and other fun horse products. Lodging at the beautiful Three Springs Ministries facility will be available on a first come, first served basis. Delicious meals can be included! The Clinic and all stalls are located at Three Springs Farm. Meals will be served at Three Springs Farm and dinners will be Friday and Saturday. Please choose a Package Deal below, then contact Brianna (brianna@threespringsministries.org. or phone 570-447-3142) for arrangements. Summer House Package: Includes two breakfasts, two lunches, two dinners, along with lodging at Three Springs Farm for Participant and Participant’s horse. Lodging is dormitory style with bathroom facilities in building. Tack Bunk Package: Includes two breakfasts, two lunches, two dinners, along with lodging at Three Springs Farm for Participant and a stall for Participant’s horse. Lodging is dormitory style with bathroom facilities close by. Basic Lunch & Stall Package: Includes lunch on both Saturday and Sunday and a stall for Participant’s horse. Spectator Lunch Package: Includes lunch for both Saturday and Sunday. Please choose your Package, then contact Brianna (brianna@threespringsministries.org. or phone 570-447-3142) to make arrangements.